Automotive, aerospace and manufacturing OEMs must leverage a network of designers, contractors, and suppliers distributed throughout the world. Large projects often involve CAD designers in multiple offices, cities or countries. This creates many challenges for IT staff such as database replication, data security, and the management of distributed workstations, while data synchronization, data transfer and old data creates challenges for designers. 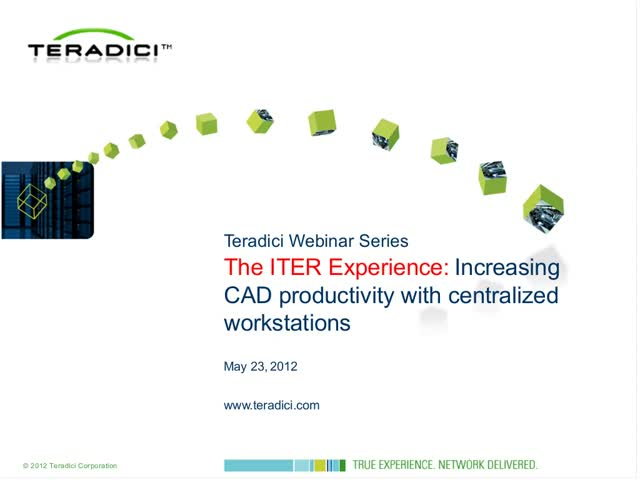 Teradici PCoIP remote workstation solutions change all this by enabling all workstations – and data – to remain in one data center, while CAD designers can work remotely using sophisticated CAD applications like CATIA, from Dassault Systemes. With remote design challenges on a massive scale, ITER, the joint international scientific experiment that aims to demonstrate the scientific and technical feasibility of fusion power, worked with MV Concept to deploy a PCoIP solution allowing researchers from multiple countries in Europe to work from a single CATIA database located in France. Their lofty goal is the design and subsequent operation of the world’s first electricity-producing fusion power plant.